In my previous post (Social Media for Small Business,) I talked about promoting your business by using social media as the distribution channel for your great original content. 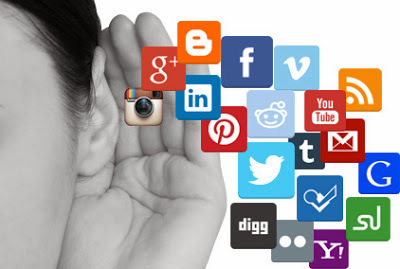 Listening to social media is another way to handle this medium to your business advantage. You need to listen to what is said about your business (company name), but you can also listen for keywords related to your industry. It is not a bad idea to even listen to what people are saying about your competitors. There is a whole range of tools available to help you follow what is said in social media - about you or your industry. And with much of social media, there are some relatively efficient and free tools available. I get daily emails with titles and summaries for the different topics and keywords I've requested Google to search. The interface is pretty simple. You add the keyword or phrase to search for, then set the timing of the email delivery (daily, weekly or monthly.) You can also you can select where to explore such as news websites, blogs, videos, etc. Finally, you enter the email address you want the alerts delivered. I have a few email alerts setup; one is for "Small Business" and another for "Mobile Web". Sometimes I set reminders for different topics I need to do research for and remove them when I finish. HootSuite is an excellent tool to manage your social media and to listen with; I'm a long-time user, and I maintain many feeds with it. The same as with Google alerts emails; you can search for keywords, hashtags and websites domains and save them as additional feeds in the HootSuite interface. I have a one for the hashtag #smb (small-midsize business) and one for yourwebdude.ca. Anytime someone shares one of my blog posts I can quickly respond to thank them or connect with them as required. technorati.com the largest blog search engine in the world. Technorati tracks “blog reactions” or blogs that link to yours, upon registration. Search for your name on Technorati and subscribe to RSS alerts, so when someone blogs about you, you will know about it. socialmention.com Social Media Alerts Like Google Alerts but for social media. If you have a bigger budget, there are a range of paid options that get good reviews. Recommended paid-for tools by Ben Romberg in a guardian.co.uk article: read the full article. Radian6 – Powerful brand monitoring tool that graphs large volumes of conversational data into charts that segment media and region quite naturally. Meltwater Buzz – Engagement and monitoring tool that allows you to find influencers in brand sectors efficiently. Meltwater Buzz has many of the functions of Radian6 as well as an Engagement Module for large-scale community management. Synthesis – The most potent monitoring tool for determining brand sentiment as a team of analysts sift through each mention and assign it a positive/ neutral/ negative rank. Synthesio also makes it possible to break conversation volume down by a topic of conversation. Why go to all this trouble? If people are talking, don't you want to get in on the conversation? If someone has something good to say, why not respond to them in real time with a thank you. And equally with negative comments, the quicker you answer, the sooner you can diffuse the issue. Wouldn't you like to know what people think about your competition? By getting this feedback, you can join the conversation about your competitors and try to make them your clients. Listening to social media can be a useful way to connect with your customers and potential new clients. If you are starting to do this, try the free tools that will only cost you time.